On September 19, 2014, I got up to stand in line at my local Apple Store. I got there at 4 AM and was eagerly waiting for iPhone 6. Frankly, I did it because the hype was overwhelming and standing in line for an Apple product launch was a bucket list event that I’ve never done before. The Apple Store open at 8 AM, and I didn’t get out of there till 11:30. Next time I’ll have to remember that you can pre-order for pick-up (I thought it was only pre-order for delivery). I love my iPhone 6 and I’m glad to have upgraded from an iPhone 4S. The size is great for displaying content. When outside of a case, it feels like velvet in my hands. On day 2, I put it in an OtterBox case because I’m a klutz – and thank goodness – I’ve dropped it several times and it survived in aforementioned case. I’m glad I didn’t pre-order because I would have gotten iPhone 6 Plus, which is a beautiful device, but at the very last minute, I realized that I already have a tablet and I need a phone that I can put into my waist (fanny) pack when I go running. Besides, I have an iPad mini and the iPhone 6 Plus is essentially a mini iPad mini to me. I have ham hands and iPhone 6 takes two hands to use comfortably. The screen on iPhone 6 is awesome, but it no longer fits snugly into the front pocket of my favorite messenger bag. Still, I’m generally pleased. The original reason I wanted to get iPhone 6 Plus was for the incredible (advertised) battery life. On iPhone 6, the battery feels like it lasts a little longer than the iPhone 4S I upgraded from. My phone drained to about 50% after 5 hours of heavy use today… which makes sense. I hear that the iPhone 6 Plus has a battery life that is dreamy… but still… that’s too much phone for me. At more than two months later, I don’t regret getting the 6 instead of the 6 Plus. 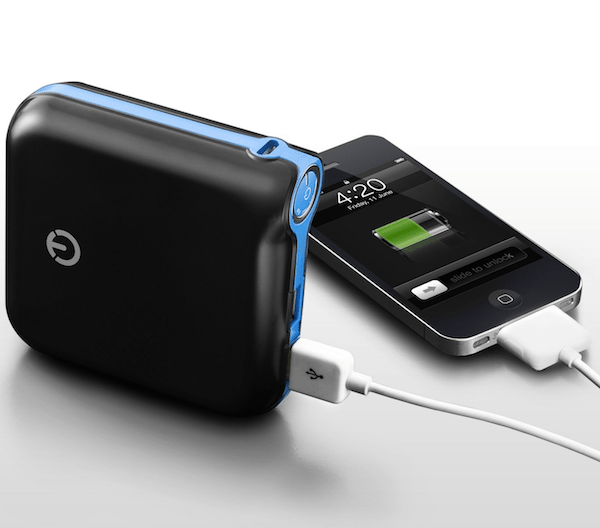 Sidenote: I bought a NewTrent battery back when I commuted via public transportation during graduate school and as a phone charger, this thing is a life-saver. While there are some bugs, I’m generally pleased. I love being able to simply put something into Evernote directly from my camera roll, rather than going through the five steps it takes to do that. I really like the Handoff feature, which lets me charge my phone in one room and be able to answer a phone call on my iPad in the other, should I receive a call on my phone. I like that all my text messages get forwarded to all of my iDevices so that I never miss a text. Apple changed something to make the visibility better when outside in the bright sun. I like Touch ID. This was not a feature on the 4S. I’m liking Apple Pay and hope that more retailers hop on board. SPEEEEEEEEEEEEED – launching apps feels zippy! The Camera is as freaking awesome as advertised. I can store more photos with the space. I was not a big fan of watching movies on my iPhone, but short videos (e.g. YouTube or actual Music Videos) show up very well on the device. Moving the Power button to the side is undoing 7 years of behavior… I’m was touching the top for the button for a good six weeks. Once I learned to touch the power button on the side, I’m now attempting to shut off my iPad mini by touching the same spot on that device. 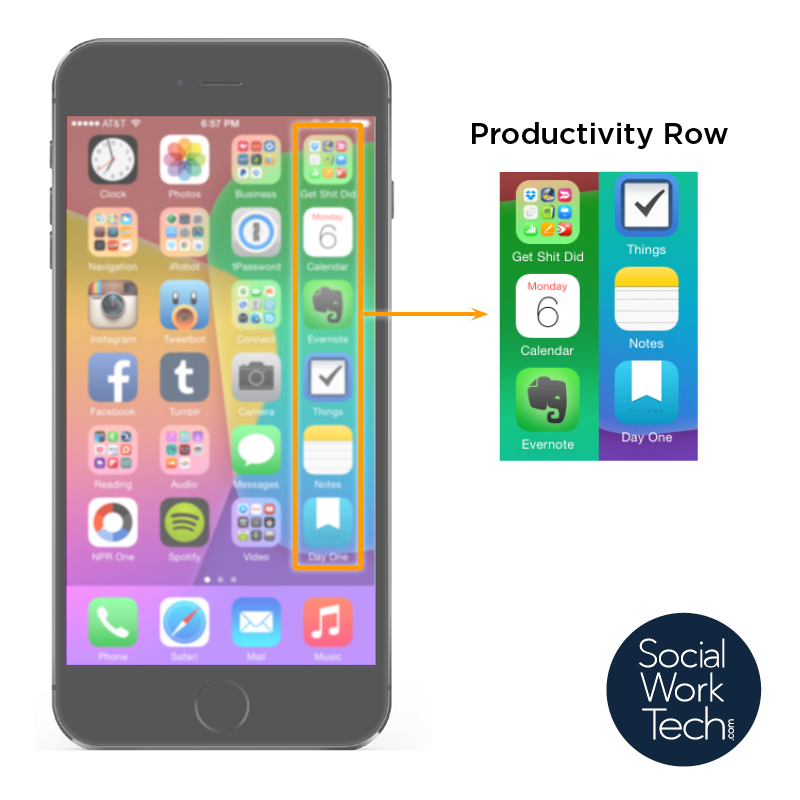 As a social worker, it’s great to have a reliable tool in my pocket to help me be resourceful and productive. Here’s how I divided my phone for me to be useful. My iPhone will always be rooted as a phone, internet device, and music player. I use these applications often, thus, they are closest to my thumb. I check email often to stay on top of messages. The bigger screen on my phone gives me a whole lot of real estate, so using Safari remains useful. In two therapy sessions, I googled two separate Paulo Coelho stories (on being present, rupturing relationships) that helped tremendously with interventions I was providing. The screen is brilliant and readable. Notes: when I need to quickly jot something down (to cut and paste into another app) or need to keep information that I quickly need to reference, I use this app. Day One: for when I catch a break and can journal about challenges and triumphs in my career. I use Apple’s dictation functionality to write many of my case notes which goes into my Notes app. Prior to upgrading, dictation worked fabulously on iPhone 4S. I love the change in iOS 8 around dictation, as it shows what you were dictating in real time. iOS 7 had you speaking and then waiting to see how much of your speech it got wrong. I dictate my notes (an acquired practice) in the same professional tone that I sit and type out my notes. Whatever I speak (and gets sent to an Apple server to be translated) is not client identifying. I use a passcode, in tandem with App-specific passwords in the apps I store my translations. With iCloud on my device, I am also able to wipe the iPhone remotely, should it get lost or stolen. Utilities are apps that help me with being productive. Clock is the first app I access in the morning. Several times. I keep several alarms for waking me up and a timer for other tasks, obligations, or medicinal reminders. Navigation apps help me to get to appointments I need to go to. Included in here is Yelp, an app I use to discover and review restaurants in lands unfamiliar to me. Business apps are those like my bank that I refer to for money management. 1Password is central so that I can quickly access the app to store or retrieve a password for business, work, or personal purposes. It also helps to keep track of my spending with my bank apps. My social media apps are front and center, for the sake of personal entertainment. My Camera gets grouped into this mix as I like sharing photos on Instagram for personal or social work reasons. I also like my camera in a central location so I can access it quickly. Then I cycle in my free time around my social media venues of choice. All work and no play makes a social worker dull and prone to burnout. I believe in these apps whole-heartedly. My Reading apps give me the news and keep my mind stimulated: Kindle, Feedly, local news, and Pocket. My Audio apps keep me entertained and/or informed: Podcasts, NPR, Coffitivity, and Audible are among my favorites. The audio apps that tell stories helps the driving time go by quickly. 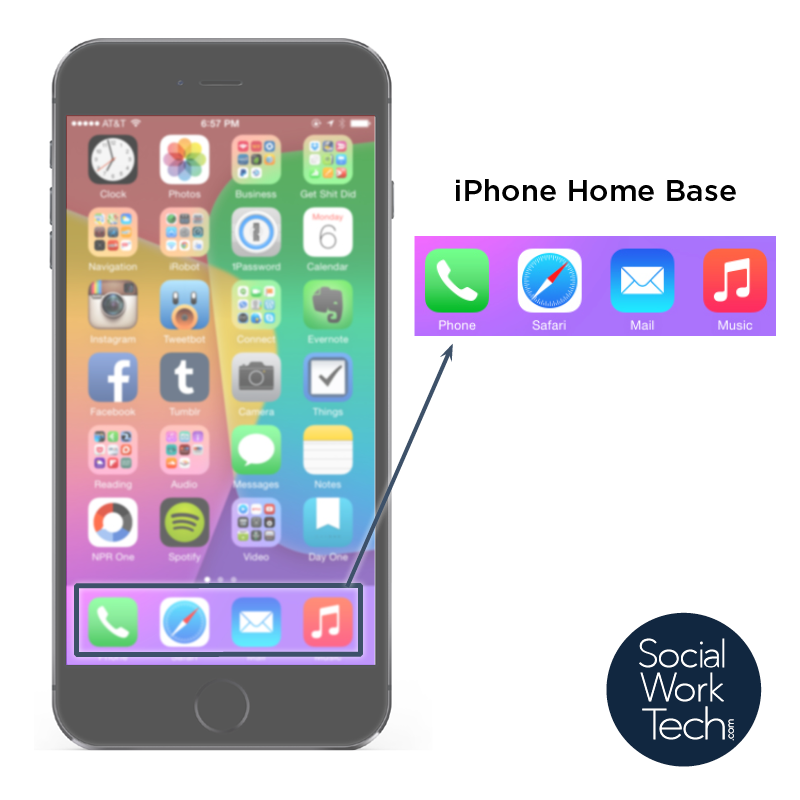 SMS / Messages/ iMessages are tops… my top Twitter peoples are pushed to my cell phone, as are my social work support network. It’s also nice to be on top of work tasks with colleagues and check in throughout the day with loved and supportive people. NPR One, which I can best describe as Pandora for news, keeps me informed with an array of stories. This is for serial, my favorite app ever. Every time the app is run, I get the hourly news update which tells me what I have missed while social work-ing really hard. I’ve given as small glimpse in how I use my smartphone while social work-ing all day. I hope it’s of use to you, whether or not you have or are considering buying an iPhone or smartphone. I love my iPhone and I would recommend it to anyone looking to upgrade their device. It’s a useful tool that provides me with information, entertainment, and management of my social work and personal activities. 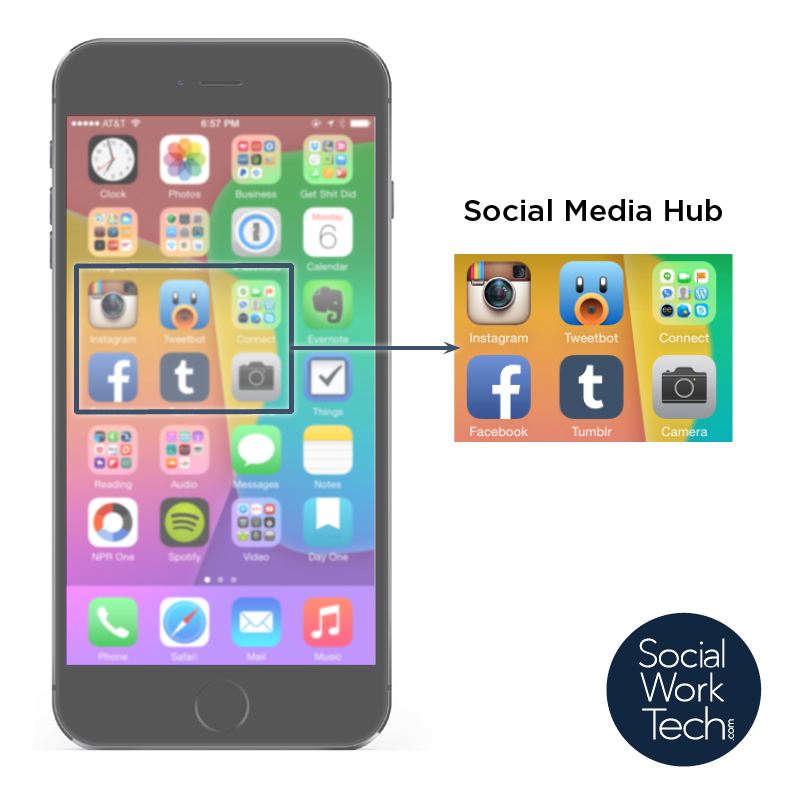 What apps do you want to see reviewed for Social Work Practice? Great post. I read this a while ago, and wanted to make a comment and then left it in my todo app of choice [OmniFocus](http://www.omnigroup.com/omnifocus) and am just having a free weekend to get around to some older things. I’m looking forward to getting the iPhone 6 (probably the plus), but haven’t been able to yet. I’m social worker who works for a school district as a mental health therapist. By the way, I’m also a huge fan of 1Password too! Keep up the posting, I like reading it. I love that you use on the focused, but I’m a Things (CulturedCode) person myself. Also, I would get the iPhone 6 Plus, as the only reason I resisted was because I have an iPad mini and as I mentioned in the article, I didn’t want a mini iPad mini. I hope I’m in your Feedly… I’ve been working on a post for that for I don ‘t know how long, but I’m trying to make this blog readable and enjoyable by folks that don’t quite understand technology.